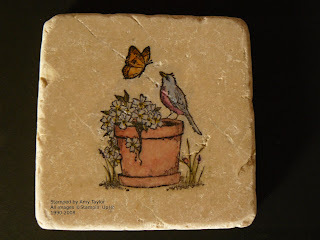 Before convention, I had time to play around with the Serene Spring stamp set (a level 2 Hostess set this fall). 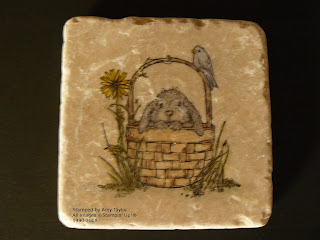 It's the perfect size stamp to use on the tumbled 4x4 tiles. The image is stamped with Staz-On Jet Black ink, and colored in with the Water Wonder Crayons and a blender pen. It is sealed with Krylon Workable Fixatif found at any craft store. The last step was to adhere a piece of cork to the back.